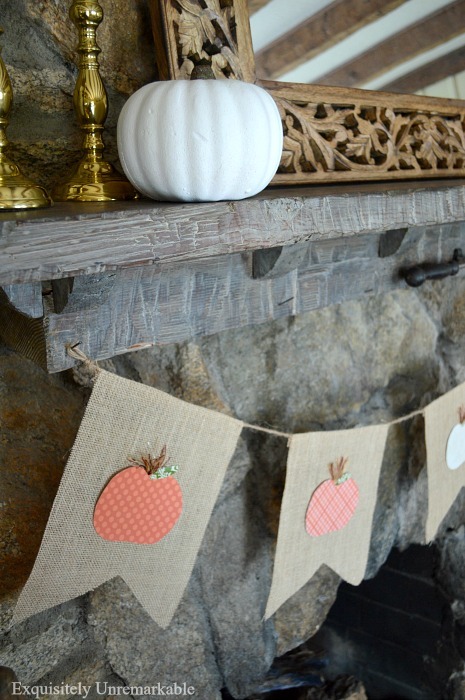 How to make a festive fall pumpkin banner in no time. Check out the super simple tutorial. It's fall y'all! Well, sort of. Here in the northeast, it's been a crazy season. Mother Nature doesn't seem to be able to make up her mind...cold one day, warm again the next. I am a dedicated summer girl. Oh, don't get me wrong, I love the colors of fall and getting cozy by the fire, but it's hard to decorate inside, when it still looks like summertime outside. That's ok. I managed. And I made a new banner. Come on. You knew it was coming. It's prominently featured in my living room. Perhaps you've already seen it. While it makes a real statement, it was super simple to make and cost me less than a dollar. Even better, this darling little banner will store flat and be ready for next year. If I don't make a new one. But we all know that I'll make a new one. Here's how I made this one. First, I pulled out my burlap banner. It's the same banner I used last Christmas and at Easter. I add the adornments with the teeniest drop of hot glue and then just remove them when the holiday is over and put them in an envelope. If I'm careful, there's no remnants of the glue and my banner is ready to go again. 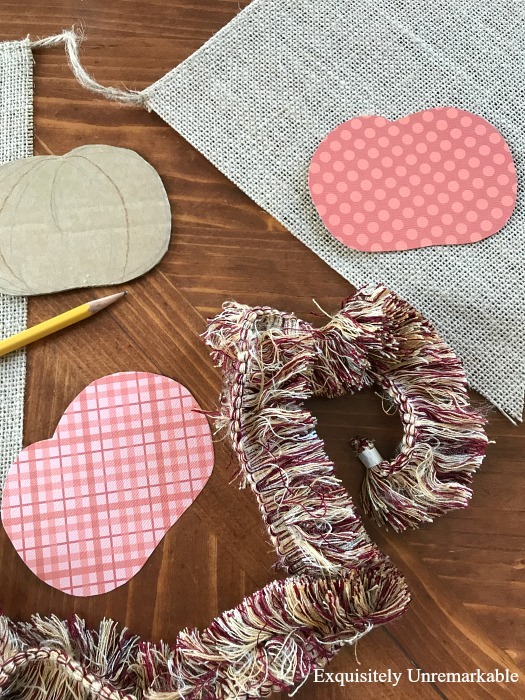 Now, I have to be honest here, I received the banner as part of a collaboration and it worked out really well, since burlap makes me sneeze and I could never imagine making one on my own...cutting that fabric up? No way...I don't want to take an antihistamine to craft. It's very versatile, the look fits the room and most importantly, there wasn't any sneezing. I never really know how I'm going to dress this banner up, until inspiration hits. This time around, it happened when I saw these pretty pieces of scrapbook pages at the craft store. They were on sale and they cost me about a buck for all three. I made a pumpkin template from an old piece of cardboard, traced the shape onto the scrapbook paper and cut out my shapes. Then I hit my craft closet to see what I had stashed away that I could use to make stems. 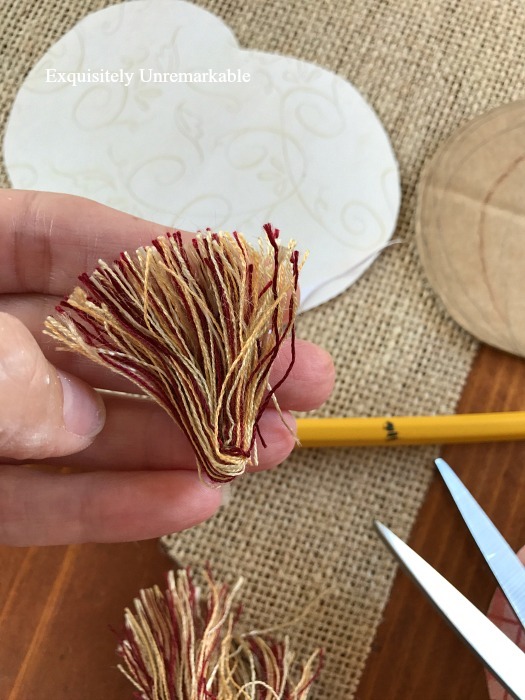 I like the look of mixing different mediums, so I decided to use some of the brush trim I had leftover from an old pillow project. It's very expensive trim and since I no longer have enough to make another pillow, I decided to put it to use. This stuff is so pretty, but you have to be careful, because once you cut it, it will quite literally fall apart. You have to make sure you tape the ends immediately or it will all unravel. I clipped a small piece of it, enough for all the stems. It was so fluffy, I spread it out and then I glued it on to the back of the pumpkin. I could've glued it on to the banner itself, but like I said before, I want to be able to pop the pumpkins off so I have a blank slate again. Too much glue would take that option away. My pumpkins were taking shape, but they needed a leaf, so I grabbed some green wrapping paper from the closet and added that, too. Then I put a drop of glue on the back of the pumpkin and pressed it ever so lightly on the banner. A simple touch for a sort of fall. Are you a banner junkie? More fall? I've got that! Yep. Banner junkie here. Very cute and so clever to reuse the background banners over and over. The beauty of that banner is that it looks fabulous with any kind of decoration attached and just as good on its own. I am so glad you’re enjoying it Judy!! Maybe one of these days, I’ll try it your way! 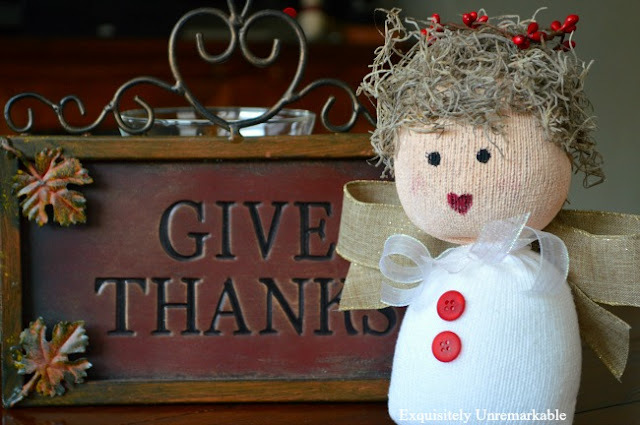 I always adore your simple and always pretty craft decor projects Kim! Might need to do some for Halloween! Thank you, Vel and your Halloween decorations are always stellar, Vel! I love your banners. I always think I'll be inspired enough to make one myself & never seem to find the motivation. Right now I'm chin deep in making giant paper flowers for a baby shower....trying to finish it before my grandson is born...any day now! So any banners will just have to wait at my house. Babies over banners every time, Jenny!! I think I may have caught a glimpse of that sweet baby boy on Instagram. If so then congratulations to you grandma! Babies are wonderful!! Enjoy! That is so cute- love the addition of the tassel stems! I can’t say that I’m a banner junkie but I always admire them. Thanks so much, Liz. I've had that fringe for so long. It deserved to be used, it's so pretty. I'm glad I found a place for it and you like it! Thanks for the visit and the comment. Happy Halloween! You are always so practical! I love the pumpkin stems. I STILL have yet to make a banner! You are the undisputed banner queen! So cute :). Love the fun bling on the pumpkins. Super cute. Have a great weekend. That is so cute. I will have to make me a banner. I love adding a banner to our fireplace mantel. Last year I bought one in the Target Dollar Spot that I love - leather string with wood slices that spell out Gather. I added clear Command hooks to the edges of the mantel and some burlap ties on the end. Easy and so fun! 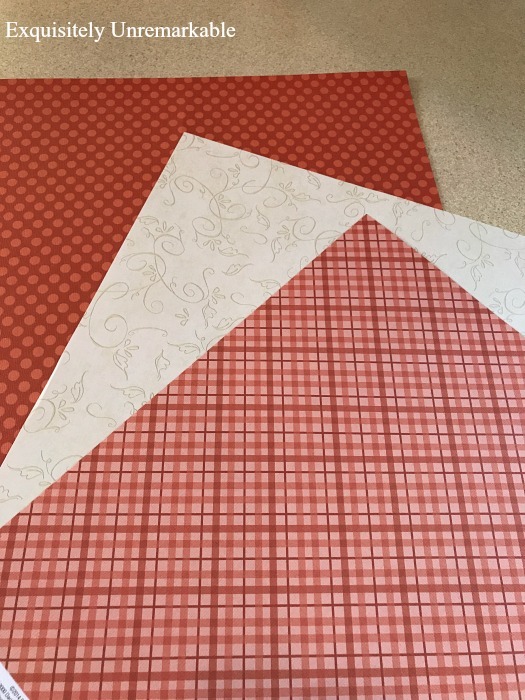 I never thought of using scrapbook paper - maybe that will be my next one to make. Yours is very cute! 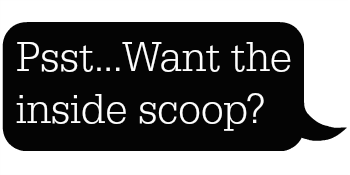 Now that sounds lovely...and from the Dollar Spot? That's a score. I'm going to have to keep my eye out for something like that...and thanks!! That is so cute. What an excellent idea to use the trim for the stem! Yes, I'm a full on addict of banners, especially this time of year. Your new one is quite lovely for fall. Looking forward to seeing what you do for Christmas. Kindred spirits for sure! I do love my banners...and Christmas is the most fun for them! Thanks so much for the visit! Thanks Lisa...and I am crushing on plaid right about now, too. I think it's a fall thing, even though it still feels like summer here. Thanks Carla! You're the sweetest! Your pumpkin banner is so cute. I love the way you make the pumpkins temporary so you can change for each season. So smart of you Kim! I am loving this weather so much and we have had such a nice fall. Hope you enjoy the weekend and week. Thanks so much, Julie and yes, so mild. It's been nice, if a little bit odd. Hope it's a great week! 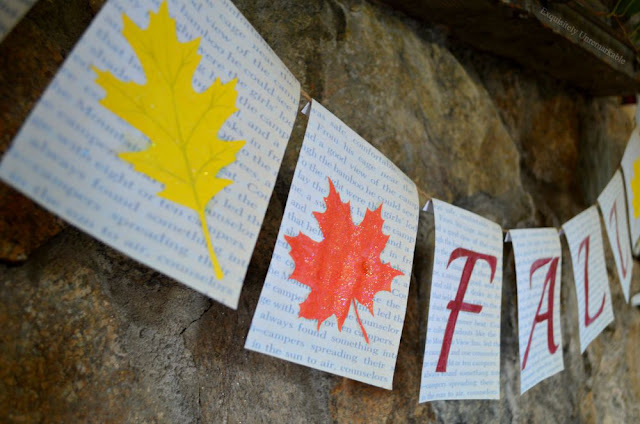 Kim, such a cute Fall banner & I love how you only use a dab of glue so you can use the banner again. Such a great idea! I haven't ventured into making a banner yet. I want to though. Gotta love that hot glue, Florence...quick and easy on and off! Love the pretty banner! I always like your crafts Kim! Have a wonderful weekend! Thanks Angela! I also appreciate your visits and comments! What a great way to cheer up a room without too much fuss. 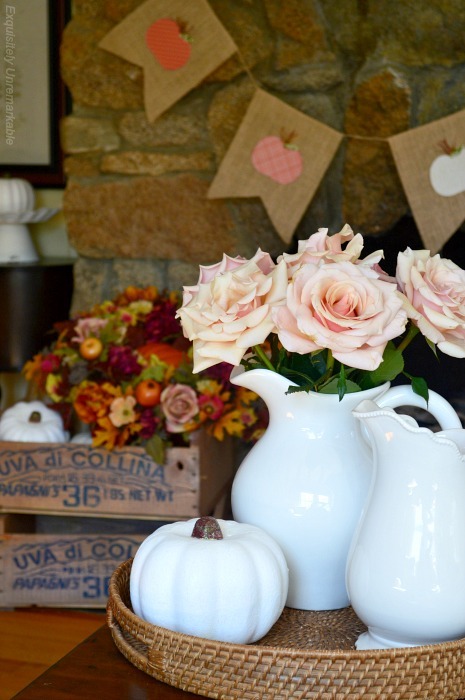 Love the colors of the pumpkins against the neutral canvas. Sayonara to all that sneezing! 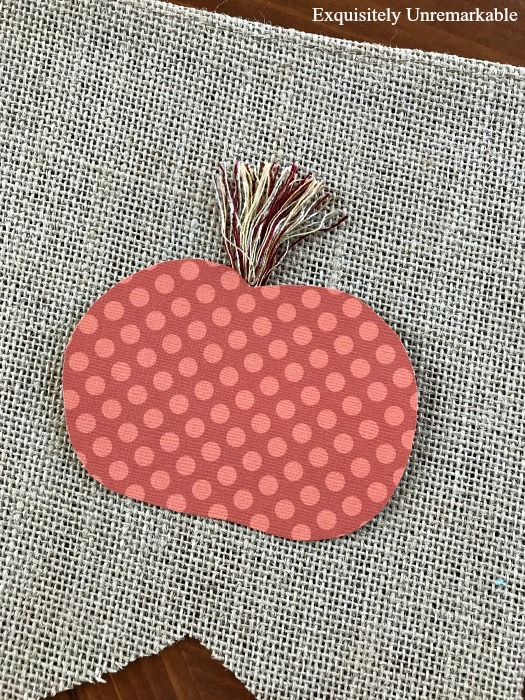 Your fall pumpkin banner is so pretty and practical and just for a few pennies, (about 100 to be precise), you crafted a masterpiece, 'Cute Pumpkins on Canvas'! Thanks for sharing all your tips, Kim. Thanks so much, Poppy. It was fun to make and yes, the lack of sneezing was certainly worth those 100 pennies!! Queen of Banners...I'll take it! Thanks Deb! What a great pumpkin garland, Kim! Gorgeous! I love that you glued paper on the burlap for the pumpkin shape. I would have used fabric. But the result turned out great! And it is soooo easy! Thank you for the lovely idea! Kisses, my friend. I love fabric, too, Mia. I usually do play with it, I have loads of red, just no orange in the house. I may have to get some now though! Thanks for popping by!! You always create the cutest banners, Kim! I really like the idea of reusing the base. 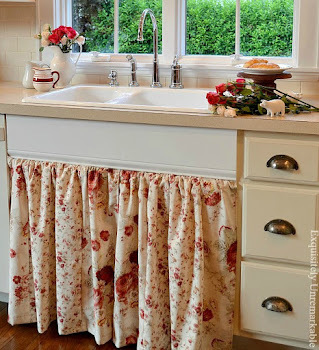 Have you ever tried using drop cloth instead of burlap....might not sneeze? Love this banner Kim. Thanks for sharing at C&C with J&J! Thanks for the pretty party, Julie!! I love your cute banner. The only Halloween banner I have out is one I made a few years ago. It's my lazy way to decorate for the holiday, Carol! And thank you! I think banners can be a wonderful addition to a room. Oh this has to be the cutest Pumpkin Banner ever Kim!!! I love how you used tassels for the top of the pumpkin! So creative!! Thanks Sam...I saw the paper and I just couldn't resist! I love that you are the banner princess! You are so creative and you have a way of making life fun! Thank you, Jemma! Blogging brought banners into my life and now I am hooked...on both! that is so cute!! love the banner! Another great banner and craft as always..I especially like how you used the tassel. Thanks so much, Marilyn! This one was super simple. I could have been a banner junkie but now I have no fireplace so that really cured me of that. But I think if I look hard enough I can find other places to put it. Your tassel idea is gorgeous. I agree, Mary! There's always a place for a banner. I have put them over windows and on my kitchen hood, even draped over furniture and pictures. Look around, I bet you have the perfect space!